This June, we are running our new 14-day-tour Archaeology, Food and Wine of Macedonia tour for the first time. 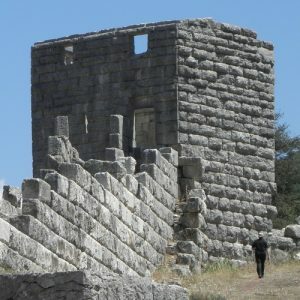 On that fascinating itinerary, we pass through a variety of Greece’s key archaeological and historical landscapes, where Macedonians, Romans, Byzantines, Jews and Ottomans have left their traces behind for us to explore. We shall do so in style, using some of the region’s best accommodations, and exploring its superb gastronomy along with its great natural beauty and immense cultural wealth. As the careful, intense and in-depth preparation of all our tours is a hallmark of Peter Sommer Travels, I had the opportunity earlier this year to join Heinrich on a last “recce” for that tour, to recheck routes and itineraries and make some final decisions regarding meals and wine-tastings. February, the very heart of Greece’s winter, is not an ideal time for travel, but we were lucky, getting some fine sunny mornings, perfect for enjoying the scenery along the road, gazing at blue skies and snow-capped mountains, combined with the atmospheric mists that distinguish the season and immerse the country in a peaceful silence. Since my own speciality as an archaeologist is the Byzantine period, I was really looking forward to exploring the region’s heritage from that period. We visited the famous monasteries of Meteora, about which I shall write another time, and the less well-known but hugely important and very lovely town of Kastoria. In the following, I’d like to share my thoughts and impressions – and also my knowledge – of that extraordinary place. Approaching Kastoria, located on a peninsula jutting into the lake of the same name, I was dazzled both by the iridescent ripples of the surrounding water and by the slated roofs of Kastoria’s traditional houses, shimmering through the mist. The sight brought to mind the 6th century AD description of the city by Procopius: “… a very lofty mountain stands above the island, one half being covered by the lake while the remainder rests upon it…” (On Buildings, IV,3,3). 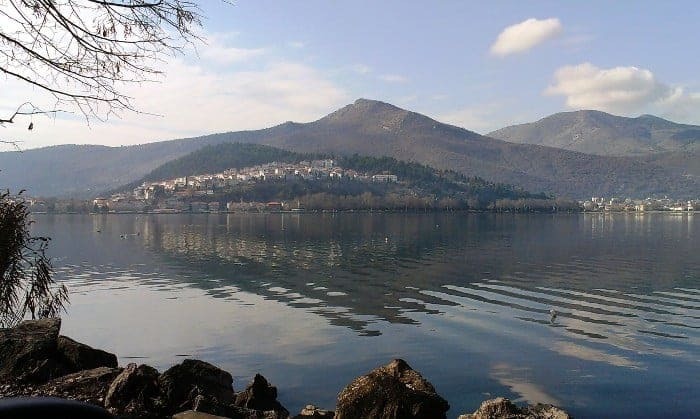 Kastoria was founded as a fortified stronghold by the 6th century AD Byzantine emperor Justinian, and parts of those early fortifications still stand 15 centuries later, both on the hilltop that was once the town’s citadel and down by the lakeshore. What really gives Kastoria a distinctive personality, a unique character, is its architecture. Most striking are its many Byzantine churches, dating from the 9th to 16th centuries. All of them are relatively small; what distinguishes them is the astonishing quality of their decorations, with excellent decorative brickwork on the exteriors and lavish fresco paintings inside. Beyond their own beauty and fascination, the churches are made even more unforgettable by their setting amid the labyrinthine lanes of Kastoria, surrounded by a wealth of local domestic architecture, a mesmerising mixture of traditional Ottoman-Macedonian style with occasional European (Neo-Classical) elements. There are dozens of such mansions, built by Kastoria’s affluent commercial classes of the 18th and 19th centuries. So, what made remote Kastoria such a prominent Byzantine city? The answer appears to lie in its key geographical position at the borderline between Orient and Occident, and its relative prominence during the 12th and 13th centuries AD, when Byzantine and Arab chroniclers noted its economic prosperity, commercial dynamism and far-reaching connections, especially with Constantinople. But still, is that enough to explain Kastoria’s brilliance and importance? We began our exploration at midday in the heart of town, at the late 12th century basilica of Saint Nicholas Kasnitzi. Seeing the church’s simple shape, who would expect the wealth of wall paintings decorating its interior? I was especially interested in the portrait of its donor, Magister Nikephoros Kasnitzis, who is shown holding a model of the church itself. 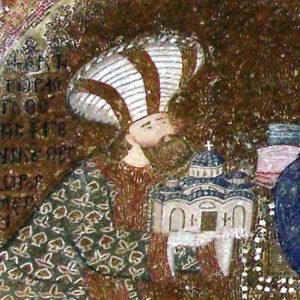 The superb quality of its frescoes and their accompanying inscriptions indicate that he was connected both to the local nobility and to the capital at Constantinople itself. 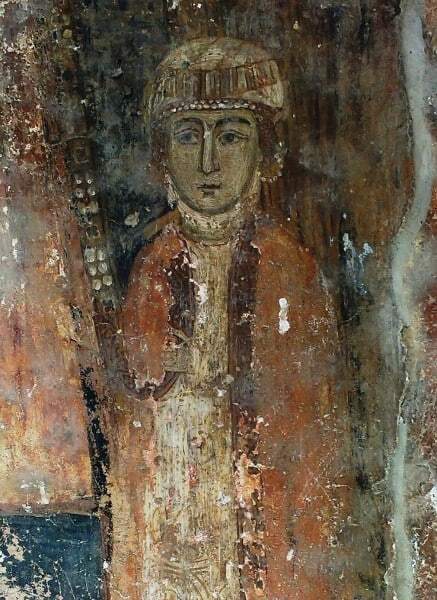 A little further downhill, in the church of the Agioi Anargyroi, its central nave soaring high above the side aisles, we found a fascinating portrait of the donor’s wife, Anna Radini, exceptionally shown in the place of honour to the right of the Virgin Mary. She is depicted wearing elaborate luxury garments and an inscription records her by her maiden name, underlining her high aristocratic status and the prestige of her origins. Her elaborate headdress and luxuriantly coiffured blond hair make the image especially memorable. 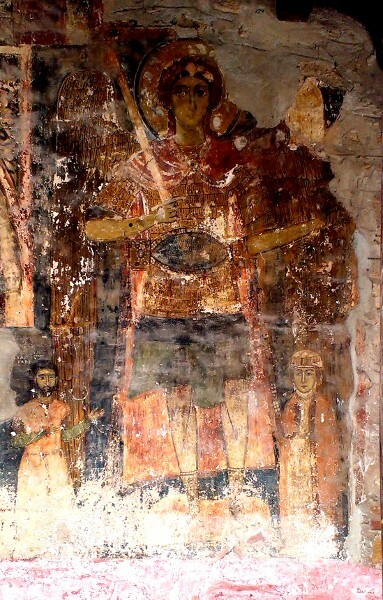 Another jewel found elsewhere in Kastoria, on the exterior of the Church of the Taxiarches, is the wonderful mid-13th century funerary portrait of Eirene Asan of Epirus, bedecked in jewellery and fineries, typical for depictions of high-born women , shown to the left of a magnificent Archangel Michael in full armour as the leader of the celestial armies. 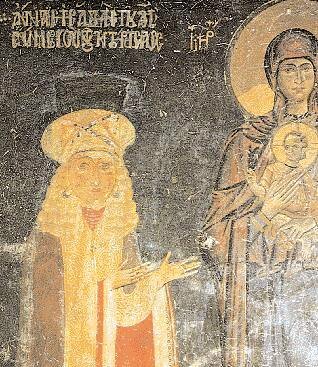 To the archangel’s right is her son, Czar Michael Asen II, King of Bulgaria, an imposing figure with a striking black-bearded face. 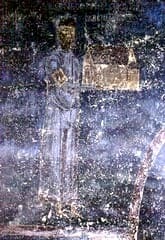 The image can be be seen as an ex-voto of Eirene and Michael, illustrating the the military success of the young Bulgarian Czar and his armies, who had invaded the territories of Macedonia and Thrace in 1255. Its presence at Kastoria highlights the city’s continuing importance in the transitory and turbulent period just before the final decline of the Byzantine Empire. At the end of the day, after visiting a great number of stunning monuments, my mind returned to that main question which has dominated my interests and my studies for years: the relation between the donor(s) and the artwork they commissioned, their role, their influence on artistic expression, and how it is to be interpreted. 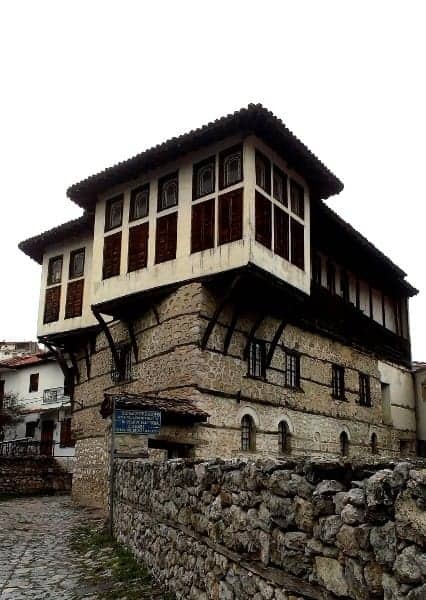 In Kastoria, this key Byzantine city, the donors’ social status – their links with the local and military aristocracy, their ideological and cultural background – is made tangible by the character and quality of the art they commissioned. What distinguishes all the churches mentioned above are the exquisite painted decorations that mirror the contemporary stylistic developments at Constantinople, the perfect metrical inscriptions, the luxurious garments of the donors and the fine armour worn by the military saints. All these refinements are very deliberate, stressing the high social and cultural status of the donors and demonstrating their links with the great regional centres (such as Thessaloniki), and moreover with the capital, Constantinople itself, confirming and underlining Kastoria’s exceptional cultural flourish in the 12th and 13th centuries. As a conclusion from these impressions of Kastoria, I have to stress that while we look at sights made of stone, mortar and paint, the stories we explore and share are about humans, their aspirations and passions, successes and failures, lives and deaths. The monuments and art are our primary source for understanding the people of the past, a living testimony of a region and its inhabitants. Donors’ portraits, dedicatory inscriptions and frescoes are a direct echo of their life and times, still in place after so many centuries, inviting us to read their stories. This is certainly the case in Kastoria, but also in Cappadocia, where wonderful painted churches allow us insights into to the mindset of a complex rural society. 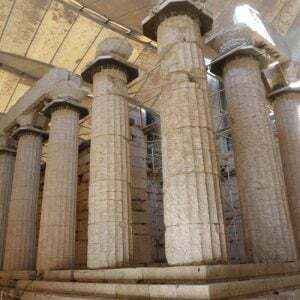 Similarly, we use the extraordinary frescoes from the Palace of Knossos on our Crete tour and from the town of Akrotiri on Santorini on our Cyclades cruise to understand the Bronze Age societies that created them. 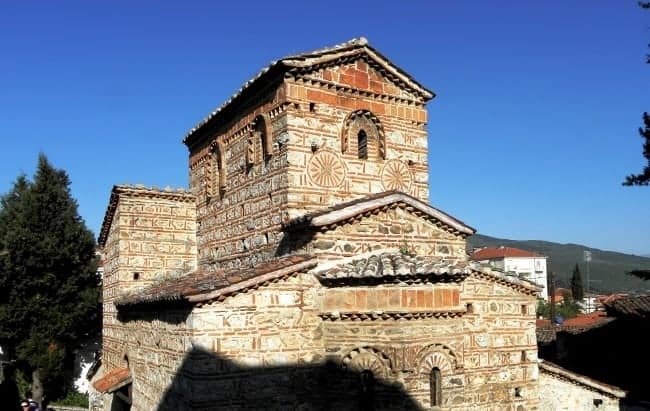 You can join us in admiring – and understanding – the Byzantine monuments of Kastoria, as well as those of Thessaloniki and Meteora, along with fascinating sites from many other periods, on The Archaeology, Food and Wine of Macedonia tour.